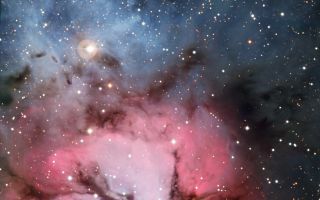 The massive star factory known as the Trifid Nebula was captured in all its glory with the Wide-Field Imager camera attached to the MPG/ESO 2.2-metre telescope at ESO’s La Silla Observatory in northern Chile. The massive star factory known as the Trifid Nebula was captured in all its glory with the Wide-Field Imager camera attached to the MPG/ESO 2.2-metre telescope at ESO’s La Silla Observatory in northern Chile in this amazing space wallpaper. So named for the dark dust bands that trisect its glowing heart, the Trifid Nebula is a rare combination of three nebulae types that reveal the fury of freshly formed stars and point to more star birth in the future. The field of view of the image is approximately 13 x 17 arcminutes.